Why replace my basement windows? Despite their small size, these windows can play a surprisingly large role in your home’s comfort, energy efficiency and curb appeal. A good bet for a better basement. Many homes have ugly, energy-wasting basement windows. It’s smart to replace these old units with new basement windows that feature maintenance-free vinyl frames and insulated glass. Everyone knows about the benefits of replacement windows. If you’ve got old wood windows with peeling paint, or windows that are difficult to operate or allow chilly air into the house in the winter, replacement windows can make life a lot easier. Most replacement windows are maintenance-free, thanks to vinyl or clad construction that eliminates the need for painting. Insulated glass combined with low-e coatings help new windows do a good job of saving energy and improving indoor comfort. And of course, new windows improve a home’s curb appeal and resale value. So there’s solid consensus that replacement windows offer a number of important benefits. But what about including basement windows in your window replacement program? This isn’t an option that many homeowners consider, even though it can be a very smart upgrade. Read on to learn why. 1. Eliminate an eyesore. It’s no surprise that many basement windows are ugly. A basement window made from wood is very likely to have wood rot or peeling paint because its grade-level location exposes the window to high moisture levels. Steel-frame basement windows are prone to rust for the same reason. Replacing these unattractive windows with new replacement units will make any home more attractive inside and out. 2. Put a stop to major air infiltration. A home’s original basement windows are likely to be very leaky, because of gaps and cracks around the window glass and cracks between the window frame and the rough opening in the basement wall. 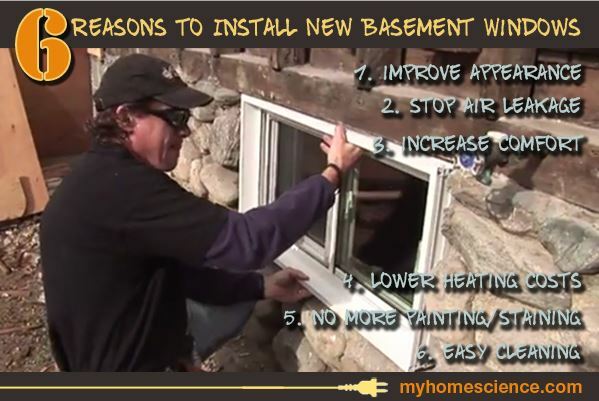 These energy-wasting air leaks can be eliminated when new basement windows are properly installed. 3. Enjoy the comfort of insulated glass. If your house has old utility-grade basement windows, there’s just a single pane of 1/8-in.-thick glass separating freezing winter temperatures from your basement interior. The resulting conductive heat loss creates a chill in the basement and in living spaces above. A new basement replacement window with insulated glass can substantially cut down on this discomfort. 4. Lower heating costs. Benefits #2 and #3 combine to provide another benefit you’ll enjoy with new basement windows: improved energy efficiency and lower heating costs. 5. Eliminate the need to paint and stain. Vinyl replacement windows can’t be damaged by moisture and won’t attract mold or rot like wood-frame windows often do. Another plus with all-vinyl windows is that they never require painting. Zero maintenance sounds pretty good, doesn’t it? 6. Make window cleaning a breeze. I really like basement windows like those offered by Dr. Energy Saver and Basement Systems because of the removable sliding sash. When it’s time to clean the glass, you can pop each sash free of the window frame for easy washing, then pop it back in again. That’s much easier than washing the glass in place. If you’re considering new basement windows, be careful about the windows you order and the contractor you hire. The limited number of standard window sizes stocked by the big box stores may not be right for your basement window openings. Contractors can “fudge” a basement window installation by using spacers and wide trim boards, but the result doesn’t look good and often gives you a smaller glass area that you’d get with a right-sized replacement window. Just like the replacement windows used in larger upstairs windows, basement replacement windows can be custom-sized to fit your house. Getting right-sized replacement units will take a little longer and cost a little more, but the end result is worth it.